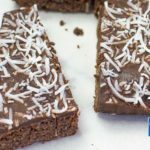 Keto Chocolate Coconut Bars RecipeKeto Coconut Chocolate Cake Bars - "Easy to Bake" - Low Carb Yet Sweet & Tasty! A favoriteEasy to Bake recipe in our family for years. We took it and exchanged the sugar and flour with some easy to come by "Low-Carb Ingredients." Yummm! Preheat your oven to 170C/340F. Line a 7x11in baking tin with parchment paper. In a mixing bowl, add all the Surkin gold, desiccated coconut, cocoa powder and baking powder. Mix well. Mix in the melted butter, egg and vanilla. Spoon the mixture into your lined baking tin and spread evenly. Bake in the oven for 20-25 minutes, until it springs back when touched. In a clean mixing bowl sift the Surkin Melis and cocoa powder. Add the melted butter, then the hot water a little at a time, while stirring until it is spreadable. Spread the frosting over the hot base, sprinkle over the shredded coconut and cool. Cut the chilled slice into 16 bars and enjoy.